Our community in DC was very diverse and we had friends and classmates of different races, languages, and cultures. It just was that way and I rarely thought about it. But now, in Vermont, I do think about it. After having lived in DC for 10+ years, the lack of cultural and racial diversity here really stands out, and it is all the more important to me to acknowledge diversity and make it a topic my children (and I) are comfortable talking about openly. Take an inventory of your home's diversity. Are your toys sending a subtle message? Make it a point to buy dolls and action figures of every race. Watch how your kids react. But that's about the extent of the diversity in our home. 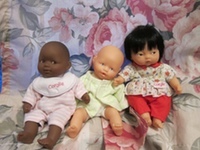 All of our "baby" dolls are white. This does not reflect the diversity I want my children to value. Why does buying non-white dolls feel uncomfortable to me? Perhaps it is because I believe a doll should be an image of the child it belongs to. That's fine, and we have that. I'm afraid if I buy a black doll my children won't want to play with it and it will become the doll no one wants. What in the world would I say if my children were fighting over who got the black doll? Wouldn't that be worse than not having any black dolls in our home? At the encouragement of a friend, I am going to face this fear and bring diversity to our family's doll population. Last year, the Easter Bunny brought Clara this doll. She LOVES him (despite the rest of us referring to it as "her," Clara insists it is a "he") and named him "Eastie," after the Easter Bunny. Katherine and Alexandra also love Eastie. Apparently, Eastie smells really good and Katherine especially loves his hard head. 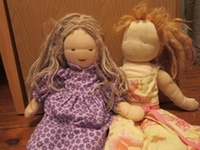 So this year, the Easter Bunny will bring these two dolls to Katherine and Alexandra. I admit I'm nervous about their reaction. Given how much they take to Eastie, what will I do or say if they are not happy with their new dolls who are exactly the same other than their race? What if they come right out and say they don't want a doll that looks like that? What will that say about my kids, or rather, about Dave and me? I have nothing prepared for this scenario. Other than to tell them these dolls were brought to them with love from the Easter Bunny, I've got nothing. Maybe - hopefully - I won't need anything and they'll be welcomed into our family as Eastie was.